I began using expensive body washes, imported bath gels and body lotions made with fancy ingredients. And now it so happened that a few months after returning from a trip to the beach, I found my skin with a bad tan along with a thick layer of dirt and dead skin. No amount of my favorite shower gels and body lotions seemed to help. The soap has not even changed slightly from the initial days I started using it. 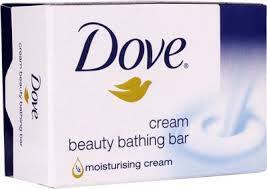 It comes in a sober blue and white packaging with the signature Dove bird logo embedded on the creamy milky white colored bar. The scent is familiar and comforting. I love the way its gentle baby powder like fragrance lingers on my skin after bath. The ¼ moisturizing cream along with five essential nutrients like vitamin E, C, green tea extract and spring water not only nourish and hydrate the skin but also help in effectively cleaning the skin of all dirt and grime build-up. No wonder it is the ideal soap to use anytime. Only a week after using Dove, I noticed my skin was getting healthier and brighter. Now a month after use, my skin feels so soft, smooth and radiant like milk. Of course, like any other good product in the market, Dove is also not a miracle product. It is definitely a great cleanser for those with dry, dull, and sensitive skin who want an affordable and easily available solution for their woes. But it is not a good choice for those who are looking for dramatic results or looking to undone years of tanning and abuse with a soap! Awww…thats so nice of you. Thanks sweetie..
Is it good for oily skin??? Yes. It’s good for all skin types.